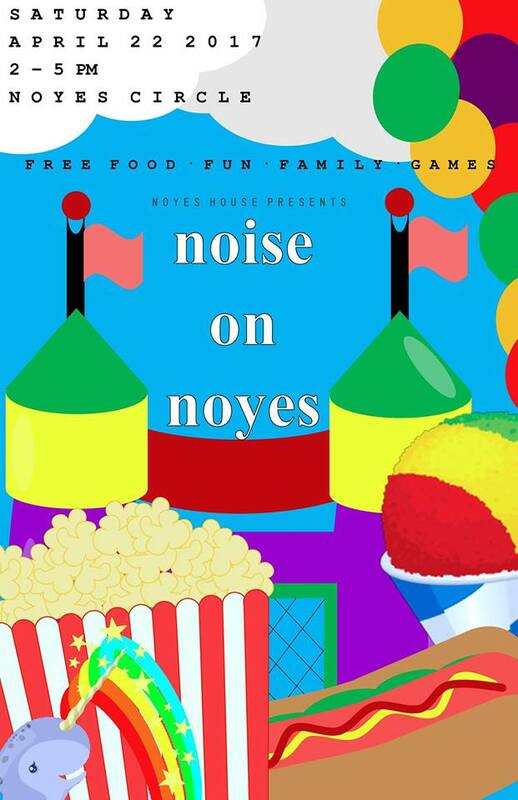 The school year may be coming to a close, but on-campus programming is only ramping up. Please read below to learn more about all the exciting events taking place this weekend in theater, comedy, dance, film, and music! Comedy Normative is ecstatic to bring Sarah Squirm and her critically acclaimed show Helltrap Nightmare to Vassar! Please join us for a darkly fun evening of stand-up, sketch comedy, noise music and performance art. Do you like Tim & Eric or Pee-wee Herman? How about mischief & mayhem? Bodysuits with painted on internal organs?? Yeah?! YOU’RE GONNA LOVE THIS SHOW. Named Best New Comic by the Chicago Reader, Sarah Squirm subverts gender expectations and the stand-up form itself with absurd characters, highbrow gross out and rhythmic wordplay. 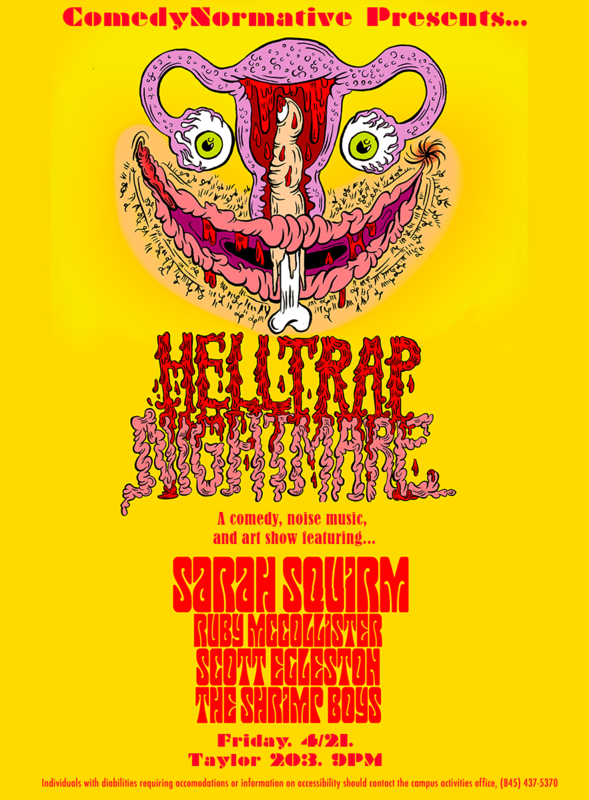 Sarah will be joined by the ghastly ghouls of Helltrap Nightmare, including Shrimp Boys sketch comedy, performance artist/comedian Ruby McCollister and lots of guts and goo! This event is brought to you by collaboration between the Feminist Action Coalition, the VC Queer Collective, Woodshed, Indecent Exposure, The Limit, VC Improv, No Offense, Office of Campus Life and Diversity, Creative Arts Across Disciplines, & ViCE Comedy. As part of the Blodgett Movie Nights series, this Friday (4/21) at 8PM VSA Operations will be screening Moonlight in Blodgett Auditorium. There will be snacks! And by that, we mean popcorn. Come get the real theater experience & bring your friends! April is Sexual Assault Awareness Month and in our current political climate, self-care, action and support are so crucial. 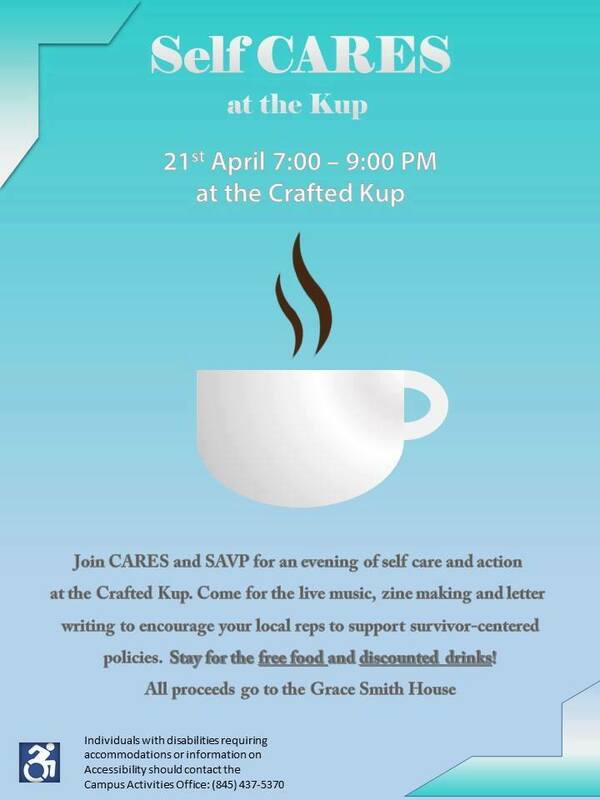 Join CARES and SAVP for an evening of all three at the Crafted Kup! Write letters to your local senators, reps and to members of Vassar’s Administration, urging them to support survivors witht their actions rather than just their words. And, because self-care is key right now, we’ll have live music, free food, discounted drinks and a zine making table! All proceeds go to the Grace Smith House, an organization that supports survivors of domestic and sexual violence. Reps from SAVP and Planned Parenthood will be tabling, with info on the various services they offer and ways to get innvolved both within Vassar and the wider Poughkeepsie Community! Considered one of Stephen Sondheim’s greatest works, Into The Woods is the story of a childless baker and his wife, who venture ~into the woods~ endeavoring to lift the curse placed on them by a Witch. In the woods, they encounter classic fairy tale characters, including Cinderella, Little Red Riding Hood, and Jack(from the beanstalk! ), each on their own quests to get the thing they wish for most. By the end of Act 1, each character has gotten their fairytale ending. In Act II, everything falls apart. A devised play sponsored by Unbound based upon the critically acclaimed game “The Sims.” Come relive memories past of staring at a screen for hours, reminisce in the beauty of simulated reality. Even if you haven’t played the Sims before, there’s fun in “The Sims” for the whole family! you’ll meet Chloe (the hot head), Valium (the prankster), Chuck (the nature boy), Henry (the brainiac), and Rosebud (the romantic). see what shenanigans and situations these roomates get into as we explore questions of reality, living with others, friendship and romance. Come see Vass Shakers dance for the last time before the end of the year! Part Two of Helltrap Nightmare, or in this case, Helltrap Daymare, takes place on Saturday at 1pm. Check out the poster below for more information on this talk. A hip hop and R&B concert featuring an incredible lineup of talented, female artists. If you don’t know Kari Faux by name, you might at least recognize her voice from Childish Gambino’s throwback-funk track “Zombies”, off of last year’s ‘Awaken, My Love!” There, Faux’s voice is breathy and quiet, but on her own, those same qualities only lend her music more heft. ‘Lost En Los Angeles,’ the up-and-coming rapper’s debut album, draws musically from the psychedelic world of 70s funk (think Parliament-Funkadelic et al). Lyrically, you’ve got love, loss, and the day-to-day grind. And drugs –– on “Supplier”, the album’s lead single, Faux, droopy eyed, raps: “Givin’ you the vibes that you desire.” The vibes are there, and so is Faux, playing tour guide for a faded night-vision rendition of West Coast listlessness, offering a soundtrack for the haze. This is a safer spaces event! There will be people on call during the event. Please refer to the policy below. Thanks!